The MedTech Connect Plan was motivated by the need to develop a conceptual framework that inventories and supports medical manufacturing activities in South Central Minnesota, as either formal or informal components of larger supply chains. It examines how and how well manufacturing and related industries leverage their geographic proximity to the medical manufacturing hub in the Twin Cities and innovations at Mayo Clinic in Rochester, both within approximately a 90- minute drive from Mankato, Minnesota. The research for this project was conducted through both qualitative and quantitative methods as methods of optimizing integration and output for regional enterprises are complex. Qualitative methods revolved around one-on-one interviews with industry professionals who have different interests and perspectives across the medical device supply chain. Interviewees were asked about challenges and barriers associated with accessing and integrating into the overall supply chain, in addition to the primary benefits of conducting business in this region. Those interested in reviewing the plan can do so by clicking the cover image on the right. 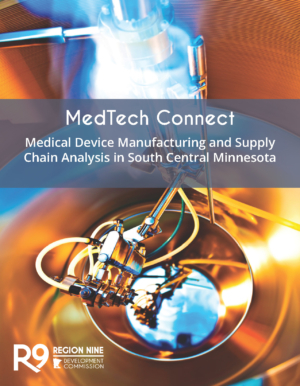 From the results of this report, Region Nine believes South Central Minnesota is poised for growth in the medical device manufacturing sector, particularly in the components and services areas. Region Nine, through funding provided by the federal Economic Development Administration, is leading the way in South Central Minnesota to establish collaboration among stakeholders in medical device manufacturing. MedTech Connect is part of two larger initiatives, Investing in Manufacturing Communities Partnership and the Minnesota Medical Manufacturing Partnership. In 2015, the Minnesota Medical Manufacturing Partnership was named as one of the 12 designees in the second round of the Investing in Manufacturing Communities Partnership initiative. Led by the U.S. Department of Commerce, the Investing in Manufacturing Communities Partnership is a multi-agency program designed to leverage economic development funds and accelerate the resurgence of manufacturing nationwide by supporting the development of long-term economic development strategies. Region Nine is expanding this designation to include the nine county region and further drive southern Minnesota to become a global leader in medical device manufacturing. Region Nine has partnered with the federal Economic Development Administration and the City of Waseca to look at the potential for a manufacturing resource center for the region, which would position current manufacturers to increase collaboration while also becoming more competitive in this high-wage, high-growth marketplace. For more information, contact Kristian Braekkan, Senior Regional Planner, at 507-389-8862 or at kristian@rndc.org.